2. Transfer to a lightly oiled bowl, cover with clingfilm and leave to prove in a warm room for 1 hour or until doubled in size. 3. Turn out the dough onto a floured surface, divide into 16 and roll into balls. Roll out each ball into a thin oval about 12cm long. Place on a large chopping board, cover loosely with clingfilm and leave for 15 minutes. 4. 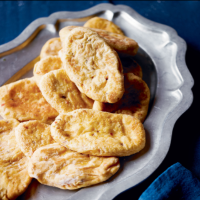 Heat a little oil in a large frying pan and fry the flatbreads in batches for 2 minutes on each side until golden brown. Keep the first batch warm in a low oven until all have been cooked, or cook all in advance and warm through in the oven just before serving.